More than 60 million Americans suffer from asthma and allergies. Indoor allergens such as dust mites, pet dander, mold, and cockroach droppings can trigger allergy and asthma symptoms in millions of allergy sufferers. In fact, a survey published in the Journal of Allergy and Clinical Immunology found that at least six allergens were detectable in more than more than 50 percent of homes. Carried in through the air, allergens can be found on furniture, floors, and other surfaces around the house. While no home can be completely allergen-free, a whole-home air cleaner can be EXTREMELY effective at removing allergens. Allergens collect in pillows, mattresses, duvets, upholstery and carpets and your standard air filter is limited by the size of the filter pores. HVAC air filters are important for removing contaminants from the air to improve your home’s air quality. The better the air quality, the better your HVAC system runs and the better your family’s health. Standard filters are very dense, and they stop dust by trapping it in a porous filter. “Pressure drop” is caused when a filter’s porous material is too small to allow for proper airflow in the system. The way to beat that is by having the finest filter materials in a separate unit called an electronic air cleaner. The Trane CleanEffects Air Purifier can help with your seasonal allergies. 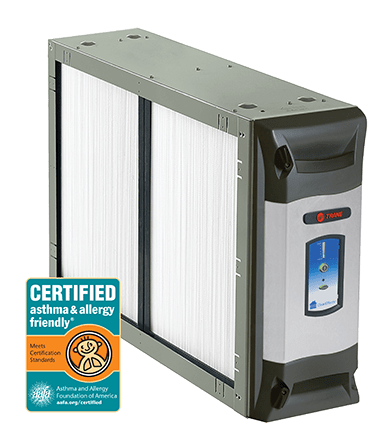 It is able to remove of up to 99.98% of particles and allergens from your filtered indoor air. It removes particles as small as .1 microns – 1/1,000th the diameter of a human hair – a size that eludes most air cleaners. Maintenance is as simple as looking at Cleaning indicators easily visible on the outside of the unit. Cleaning the filters requires you to just vacuum or rinse them once every 3 to 9 months (depending on usage). If you’re interested in having the best air quality for your home, or concerns about your families allergies, give us a call at 817-488-6733 and schedule a consultation. Trane Clean Effects systems are the premier whole-home air cleaning solutions.